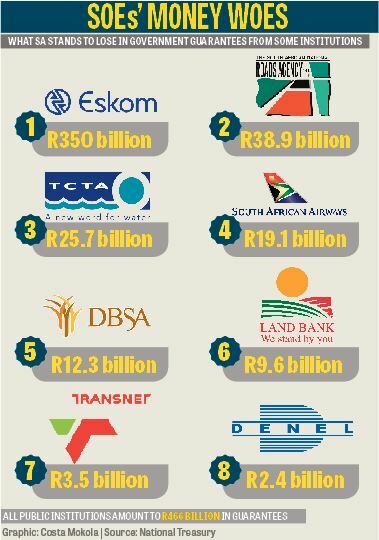 It is also not sustainable for public money to be used every year to bail out these companies, with national debt already approaching R2.5 trillion. South Africa’s struggling state-owned enterprises (SOEs) have been mismanaged into a debt hole, and they run the risk of crippling government’s contingent liabilities, experts have warned. Selling them off, in light of the half-a-trillion-rand debt these companies are in, is not a feasible plan, while South Africa would be forced to pay up to R466 billion in guarantees should its state companies not be able to meet their debt responsibilities. While the Free Market Foundation has repeatedly called for the privatisation of South African Airways (SAA), economist Professor Jannie Rossouw said ailing state companies such as SAA should serve as a lesson on the “reckless” dishing out of government guarantees. This year government committed to a further R5 billion to the airline, which has outstanding guarantees amounting to R19 million. “SAA has shown us that we should not be reckless with giving guarantees because when the time comes for payment and the SOEs cannot continue, government will have to pay all of that money,” said Rossouw. Another economist, Dr Kenneth Creamer, said corruption and mismanagement and, to a lesser extent, disruptive technological changes, had led to the bad performance of many of SOEs. It was therefore not sustainable for public money to be used annually to bail out these companies. “It is imperative that a pragmatic approach be adopted – not driven by grand theories of nationalisation or privatisation – which seeks to restructure state-owned companies so that they can offer their core services to the wider population in a way that is financially sustainable,” said Creamer. Creamer cautioned against the temptation to “overly politicise this matter” in favour of pursuing more pragmatic solutions. Government debt has been a growing concern, as highlighted in the 2018 budget review, placing further risks to the state’s contingency liabilities. In the document, National Treasury noted state power utility Eskom’s financial position as a major risk to public finances. National debt was approaching R2.5 trillion, according to National Treasury. “The debts of SOEs have also increased rapidly,” it noted. “Several of these companies have large government guarantees and their long-term viability is a concern. If South African Airways can find a buyer, The Free Market Foundation (FMF) estimated that it could cost a total of R18.8 billion, of which the state would have to cough up R11 billion. This is if SAA’s R7.8 billion in held assets were used to pay creditors. Finance Minister Tito Mboweni is on record as saying no one would buy SAA because they would be taking on an immediate debt of R22 billion, Baccleone pointed out. Addressing parliament while making the case for another bailout for the airline, Deputy Finance Minister Mondli Gungubele said that it would cost R60 billion to close down SAA. “Since then, the figure of R60 billion cost to close down SAA has been bandied about in the media. It is difficult to see where that comes from other than a scare tactic to stop discussion about closing SAA and justify bailouts,” Baccleone said. She said this was highly unlikely. SAA has said it needs R21.7 billion to break even over three years.